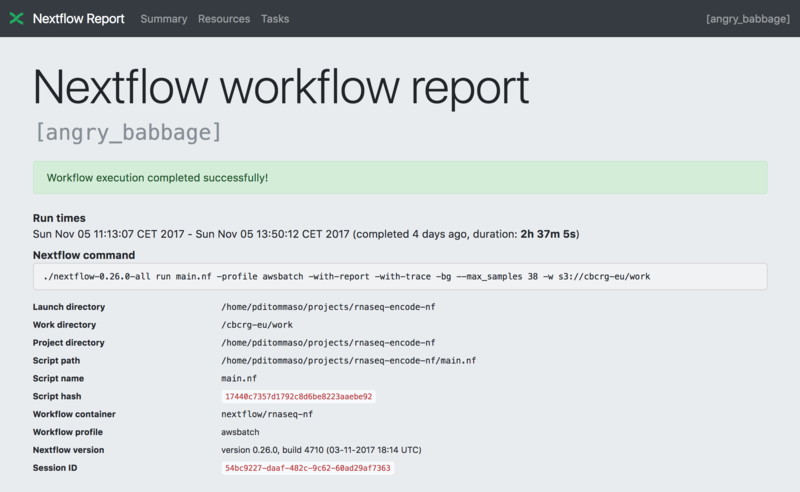 Nextflow can create an HTML execution report: a single document which includes many useful metrics about a workflow execution. The report is organised in the three main sections: Summary , Resources and Tasks (see below for details). The report file name can be specified as an optional parameter following the report option. The Resources sections plots the distributions of resource usages for each workflow process using the interactive plotly.js plotting library. Plots are shown for CPU, memory, job duration and disk I/O. They have two (or three) tabs with the raw values and a percentage representation showing what proportion of the requested resources were used. These plots are very helpful to check that job pipeline requests are efficient. 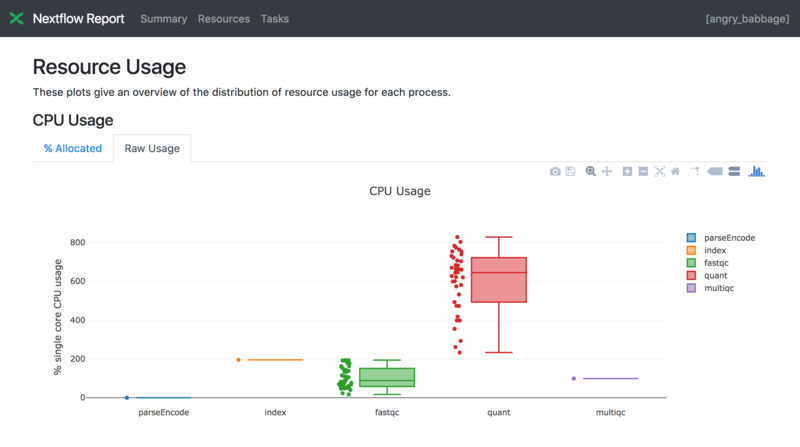 Learn more about how resource usage are computed in the Metrics documentation. Nextflow collect these metrics running a background process for each job in the target environment. Make sure the following tools are available awk, date, grep, egrep, ps, sed, tail, tee in the system where the jobs are executed. Moreover some of these metrics are not reported when using a Mac OSX system. See the note message about that in the Trace report below. A common problem when using a third party container image is that it does not ship one or more of the above utilities resulting in an empty execution report. Please read Report scope section to learn more about the execution report configuration details. Nextflow creates an execution tracing file that contains some useful information about each process executed in your pipeline script, including: submission time, start time, completion time, cpu and memory used. native_id Task ID given by the underlying execution system e.g. POSIX process PID when executed locally, job ID when executed by a grid engine, etc. tag User provided identifier associated this task. exit POSIX process exit status. module Environment module used to run the task. container Docker image name used to execute the task. cpus The cpus number request for the task execution. disk The disk space request for the task execution. memory The memory request for the task execution. attempt Attempt at which the task completed. submit Timestamp when the task has been submitted. start Timestamp when the task execution has started. complete Timestamp when task execution has completed. duration Time elapsed to complete since the submission. realtime Task execution time i.e. delta between completion and start timestamp. queue The queue that the executor attempted to run the process on. %cpu Percentage of CPU used by the process. %mem Percentage of memory used by the process. rss Real memory (resident set) size of the process. Equivalent to ps -o rss . vmem Virtual memory size of the process. Equivalent to ps -o vsize . peak_rss Peak of real memory. This data is read from field VmHWM in /proc/$pid/status file. peak_vmem Peak of virtual memory. This data is read from field VmPeak in /proc/$pid/status file. rchar Number of bytes the process read, using any read-like system call from files, pipes, tty, etc. This data is read from file /proc/$pid/io. wchar Number of bytes the process wrote, using any write-like system call. This data is read from file /proc/$pid/io. syscr Number of read-like system call invocations that the process performed. This data is read from file /proc/$pid/io. syscw Number of write-like system call invocations that the process performed. This data is read from file /proc/$pid/io. read_bytes Number of bytes the process directly read from disk. This data is read from file /proc/$pid/io. write_bytes Number of bytes the process originally dirtied in the page-cache (assuming they will go to disk later). This data is read from file /proc/$pid/io. vol_ctxt Number of voluntary context switches. inv_ctxt Number of involuntary context switches. These numbers provide an estimation of the resources used by running tasks. They should not be intended as an alternative to low level performance analysis provided by other tools and they may not be fully accurate, in particular for very short-lived tasks (running for less than one second). Trace report layout and other configuration settings can be specified by using the nextflow.config configuration file. Please read Trace scope section to learn more about it. Each bar represents a process run in the pipeline execution. The bar length represents the task duration time (wall-time). The colored area in each bar represents the real execution time. The grey area to the left of the colored area represents the task scheduling wait time. The grey area to the right of the colored area represents the task termination time (clean-up and file un-staging). The numbers on the x-axis represent the time in absolute units eg. minutes, hours, etc. Each bar displays two numbers: the task duration time and the virtual memory size peak. As each process can spawn many tasks, colors are used to identify those tasks belonging to the same process. The report file name can be specified as an optional parameter following the timeline option. 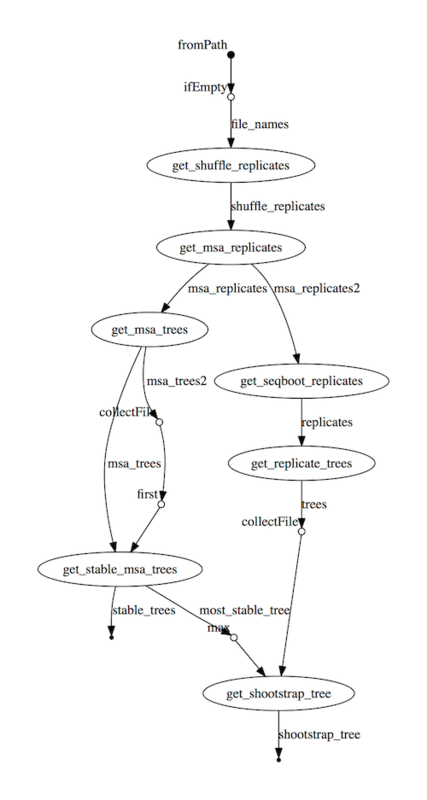 A Nextflow pipeline is implicitly modelled by a direct acyclic graph (DAG). The vertices in the graph represent the pipeline's processes and operators, while the edges represent the data connections (i.e. channels) between them. The pipeline execution DAG can be outputted by adding the -with-dag option to the run command line. It creates a file named dag.dot containing a textual representation of the pipeline execution graph in the DOT format. The file formats marked with a * require the Graphviz tool installed in your computer. runName The workflow execution run name. runId The workflow execution unique ID. event The workflow execution event. One of started, process_submitted, process_started, process_completed, error, completed. utcTime The UTC timestamp in ISO 8601 format. 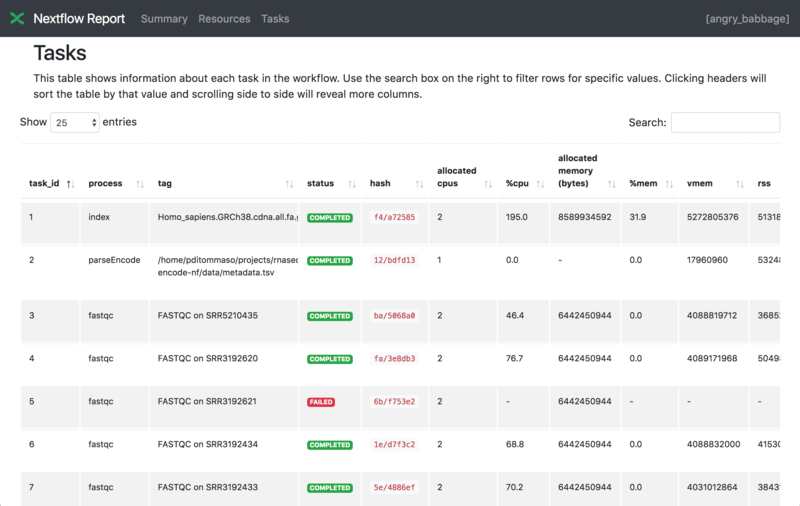 trace A process runtime information as described in the trace fields section. This attribute is only provided for the following events: process_submitted, process_started, process_completed, error. metadata The workflow metadata including the config manifest. For a list of all fields, have a look at the bottom message examples. This attribute is only provided for the following events: started, completed. The content of the trace attribute depends on the settings for the Trace report defined in the nextflow.config file. See the Trace configuration section to learn more.